At Disney, protecting nature for the benefit of people and the planet is a commitment that dates back to our founding. Disney’s ongoing environmental efforts reach across the company – through policies and projects big and small – and around the world by working with leading conservation organizations. 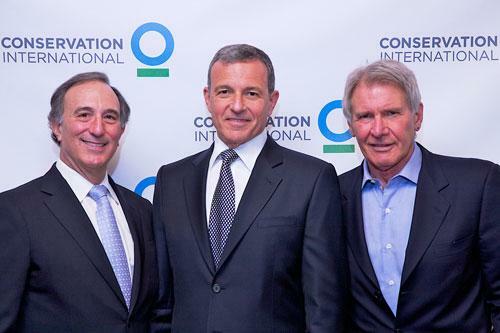 Last week, Conservation International (CI) — an organization we've worked with for more than two decades — celebrated this meaningful collaboration by presenting Disney with its Global Conservation Leadership Award at a special ceremony attended by Disney Chairman and CEO Bob Iger. This week I had an opportunity to connect with CI Chairman and CEO Peter Seligmann to learn more about the award and CI's important mission. How does CI inspire conservation efforts? CI has great success stories: since 1987 we've discovered new species and protected 200 million acres (think of an area 30 miles wide, wrapped around the equator). But a few years ago I started to wonder if that would be enough. Because nature doesn't need people, people need nature — not only to survive, but thrive. I realized our work is actually about protecting human well-being. We’re focusing on restoring and maintaining the ecosystems that give us life, that make our farms productive, our cities livable and our children healthy. What role do partnerships play in your mission? From day one, I believed CI needed to actively and transparently engage with all sectors of society from national governments to communities to corporations. Because environmental issues are massive and complex, the most effective way to find solutions is to partner. The reality is the challenges we face are great and we need the intelligence, creativity and resourcefulness of all sectors of society working together. And leading businesses like Disney — who we've worked with for nearly two decades — are helping create innovative approaches that recognize the key role nature plays in a healthy society. Why did CI recognize Disney with the Global Conservation Leadership Award? At CI, we believe that certain uncommon commitments and actions deserve to be honored. As part of their broader sustainability initiative, Disney has worked with CI to protect tropical forests in Peru and the Democratic Republic of Congo, which is crucial in our efforts to stop global climate change. Through its movies and media properties, through its parks and beloved characters, Disney is committed to connecting kids with nature. Nothing is more important for the long-term well-being of our planet.